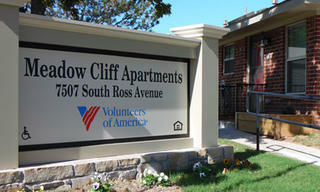 Betty and Edwina are two of the active seniors at Meadow Cliff Apartments in south Oklahoma City. 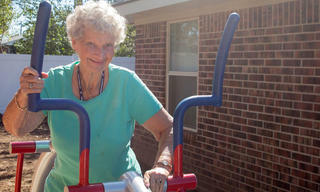 Betty is often seen on the elliptical trainer which is one of six senior playground areas in the complex; arranged next to the apartment buildings for easy access. 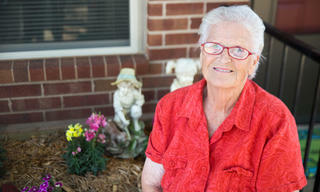 Edwina loves flowers and the planter box outside her unit is perfect for planting and tending to her passion. 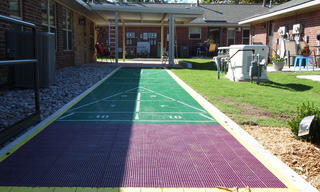 Besides equipment and planter boxes, shuffle board, Tai Chi and other activities encourage the 57 residents to remain active and provides the sense of community that seniors need. In the last year, the apartment complex underwent a $9 million renovation setting a new standard in senior housing with safety, health and wellness as a top priority. 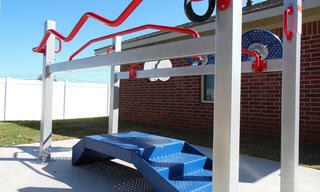 Four tornado shelters were also installed assuring residents a safe shelter in case of future tornadoes. New technology was integrated through medical alert bracelets that residents can alert for help from anywhere on the complex. The residents’ faces are full of big smiles and it’s no wonder that the waiting list for apartment openings continues to grow. Your contribution assists seniors in remaining vibrant, active and healthy in their golden years.